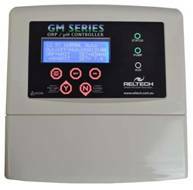 The GM Series is a fully controlled salt water management system. A multi-electrode probe analyses water chemistry and determines how much chlorine needs to be produced by the electrolytic cell. The probe also assesses the pH of the water and adjusts as necessary. The GM Series has been specially designed to automatically manage mineral pools. The water chemistry of mineral pools is surprisingly complex, but a GM Series system takes the guesswork out of managing your pool. The ultimate in salt water chlorination, Reltech's PC Series salt water management systems come with all the features you'd expect from a top of the range salt chlorinator plus programmable timed light outlets and optional pH control for optimum water balance. Unlike other chlorinators on the market, the PC Series operate on 50% less salt for lighter and softer feeling water. The PC Series is also compatible with all available pool salts including special blends of mineral salts containing Magnesium and Potassium. All PC Series salt chlorinators are available with optional pH control. This is achieved by a clever inbuilt algorythym, which calculates how much acid needs to be dosed, depending on the amount of chlorine produced and water temperature. This ingenious method of pH control offers excellent reliability at an affordable price, as it does away with expensive probes. It also does away with periodic recalibration of probes, making it easy and cost effective to maintain. Plumbed into your pool's suction line, the pH controller utilises your existing filtration system to evenly distribute minute amounts of liquid acid throughout your pool and spa for perfectly balanced water. Venturi injection kits and peristaltic pumps are also available. 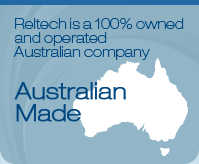 The EvoChlor Self Cleaning Mineral Salt Chlorinator is Australian designed and manufactured. The EvoChlor has a technologically advanced digital micro processing PCB and works with standard salts & Reltech’s “ELEMENT” mineral / magnesium salt. Has a user friendly and easy to set clock. Is energy efficient with low kw consumption, has no internal fuse / external reset button.